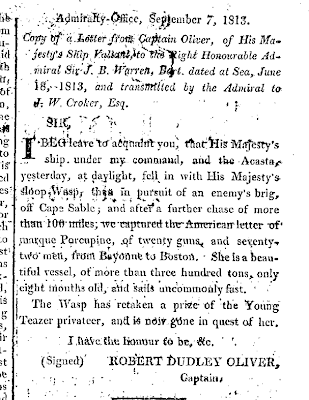 Valiant was in company with Acasta when they came upon Wasp in pursuit of an American brig off Cape Sable. The three British ships continued the chase for another 100 miles before they finally were able to capture the brig. She was the letter of marque Porcupine, of more than 300 tons, and was carrying a valuable cargo of brandy and silks from Bayonne to Boston. In his letter to the Admiralty of 7 September, a copy of which was printed in the London Gazette, Captain Robert Dudley Oliver of Valiant described Porcupine as being only eight months old and an uncommonly fast sailer. 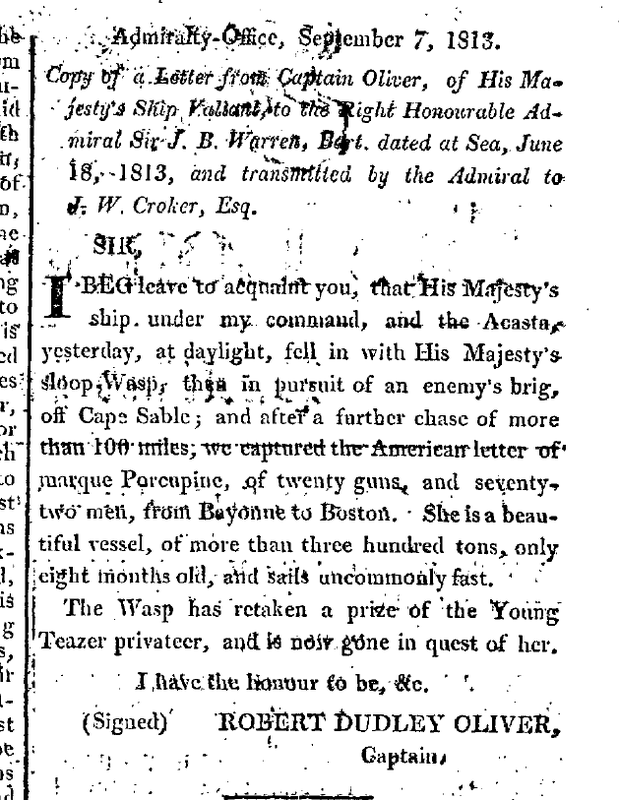 After the capture, Wasp, which had recaptured a prize that the privateer Young Teazer had taken, sailed in search of the privateer. HMS Valiant was a 74-gun third rate ship of the line of the Royal Navy, launched on 24 January 1807 at Blackwall Yard.